Whether you are a passionate green-thumb or have removed old trees from your garden, disposing of the mess is important. Aside from the aesthetic appeal, disposing of green waste will keep your garden and home from unwanted pests and debris, ensuring you can maintain kerbside appeal and style. Green waste has long been associated with compost. As these materials are biodegradable and they don’t have any negative impact on the environment. In fact, these materials do more good for your garden than any store-bought soil or fertiliser, saving you time and money on your garden. Not only that, but you are reducing your carbon footprint by using fewer chemicals in your garden. Disposing of green waste in our skips needs to be done according to certain specifications. If you hire a skip for green waste, anything from grass and tree clippings to bark and branches are allowed; however, if you need a skip for clay and dirt, only clay and dirt can be disposed of. It also is important to know that tree trunks/stumps larger than 150mm in diameter are not permitted in our standard Green Waste skips. Simply speak to one of our experts if you have large trunks and stumps and we will find the perfect bin for you. Disposing of green waste in a safe manner is important to ensuring that no mess is left behind. Although it is biodegradable, you don’t want any material to spill out from the bin as it can become a safety issue. Never fill the bin beyond the height of the skip, as our driver won’t be able to load it onto the truck. If you are planning on cleaning up your garden, be sure you have the right bin to dispose of the waste. With our bins, you can easily dispose of those old tree clippings and plants in a safe and compact manner. For further enquiries, contact us online or call Matt’s Skip Bins today on (02) 4708 2927. 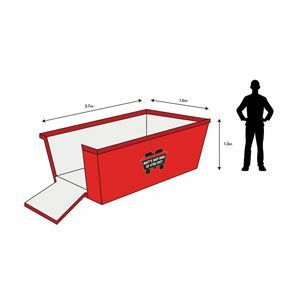 After choosing the type of bin that you’ll need for your clean-up, you’ll need to choose the right bin size. But what is the right bin size? 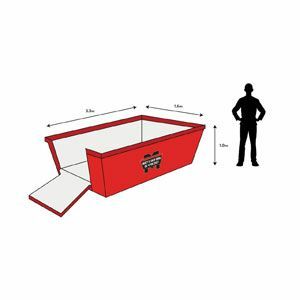 The right bin size for you will be determined by the size of the clean-up, with larger clean-ups requiring larger bins. 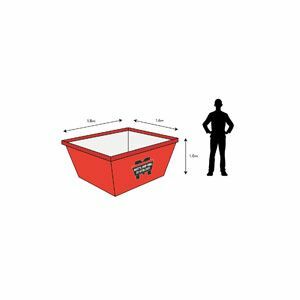 At Matt’s Skip Bins, we have a range of skip bin sizes designed for every job, from the small 2m2 skip bin, designed for spring cleaning and tree pruning, to our massive 10m2 skip bin, designed for large-scale landscaping and other large projects. 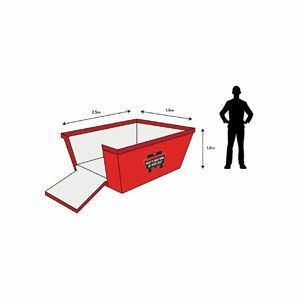 If you need a hand finding the right skip bin, click below to find the right bin size for your project. Perfect for: Bathroom renovations, garage & shed clean-outs, green waste, etc. 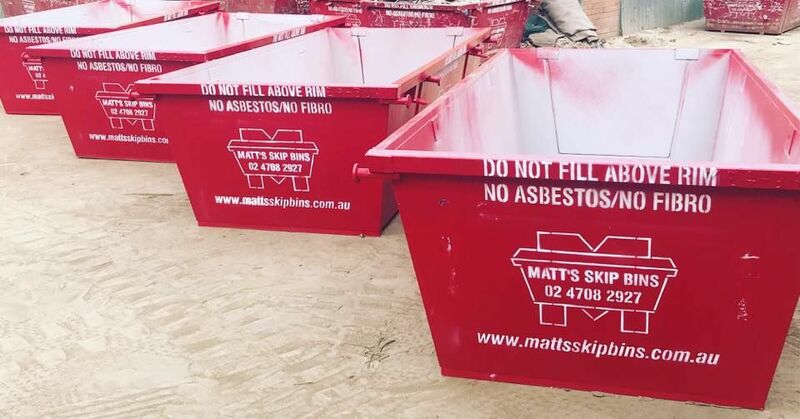 At Matt’s Skip Bins, we’re proud to supply our skip bins to homeowners, business owners, and site owners all over Western Sydney. If you find that your area isn’t listed on our map, please call our friendly team on 02 47082927 to find out if your area is serviced. 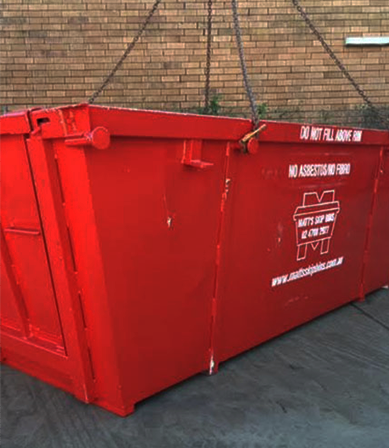 We have a large range of skip bin sizes, ranging from a small 2m² bin all the way up to massive 10m² bins, for all types of waste! All the waste in our bins are recycled in our recycling yard, as we aim to make sure 90% or more is reused or kept out of landfill.